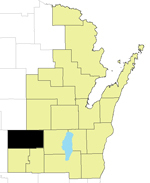 Waushara County, located in central Wisconsin, was created in 1851 from Marquette County. The county seat is Wautoma. The name "Waushara" is thought to be the settlers' attempt at applying a Native American term meaning "good land."